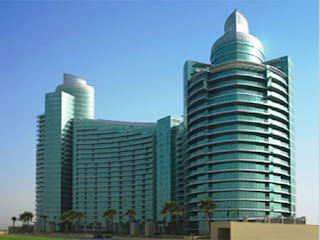 We went to the Intercontinental hotel last night with expectations of a casual evening with good, lite food. 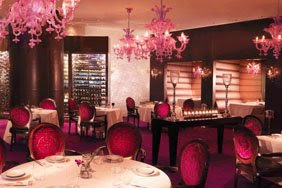 We have eaten at Dubai staples like Verre and Rhodes' Mezzanine, and U.S. institutions Charlie Trotters, Inn at Little Washington, and Jean Georges. And we spent most of the dozen or so courses of food trying to figure out how on Earth this tiny restaurant just happened to be better than almost anything else out there. For starters (pardon the pun! ), we never had a chance. 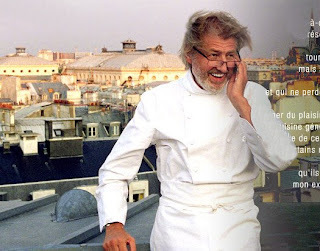 The head chef/part owner in the restaurant is Pierre Gagnaire, who has restaurants Tokyo, Hong Kong, and of course, Paris. Oh yeah, and three Michelin stars next to his name as well. Thanks to our friends at club concierge, he personally cooked us dinner with his Chef de Cuisine, Olivier. 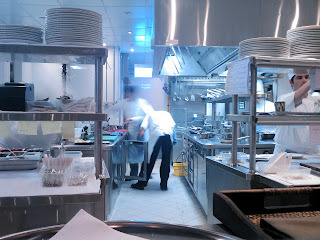 And oh yeah again - courtesy of the economic downturn, they provided us with a free glass of champagne while we went on a private tour of the busiest kitchen I'd ever seen with Chef Gagniere (they were cleaning up when I took this pic). So, the food! It's no wonder the kitchen was busy - we had not one amuse bouche, but ELEVEN. Each of them with a crazy amount of prep and ingredients - scotch and bourbon jelly candy in toasted breadcrumbs, ground mustard biscuits with mustard hummus, fois gras cream lollipops - the list goes on. Katie also threw a kink in the gears when she substituted two things on her tasting menu (she wanted the beef!). That meant that everything had to be changed to match, only there weren't any matching starters. So Chef Gagnaire made up her dishes himself - he thought we didn't see him, but he came out of the kitchen and lurked around the corner from our table watching her whenever she was served. He made her a lobster plate with a broth and claws that tasting like I was on a lobster boat. Following that was a hollowed-out boat of aubergine, filled with a delicious anise sauce and all sorts of other green things (seriously, I'm way out of my league here). In short, this chef made dishes with absurd numbers of ingredients, and they were phenomenal. Usually, at a restaurant, I can imagine myself able to reproduce the dish after a fair amount of trial and error. At Reflets, I can safely say that the food is just impossible to reproduce. My seafood dish had crab, lobster, fois gras, tomatoes, pasta, and pepper crumbs. Honestly, it tasted amazing together - and I'm still reeling just trying to figure out how he did the broth it was in. Not with years of training would I be able to make what I ate. And to boot, all of this was done with imported ingredients! It's not just food - in Dubai, wines are overpriced and underserved. The wine pairings we experienced at Reflet out-of-this-"town". Rarely in Dubai do people treat the wine they serve with a vaunted respect, rather than just a non-fizzy beer. We experienced a custom-picked wine pairing for each course, poured at a half-glass size just to keep us from exploding by the end of the night. So, when we couldn't eat any more (literally, the staff was getting annoyed because we kept saying "NO!" when they brought food), we joined the staff at the bar for an herbal-infused water. They say it aided digestion, and whether it was just sitting at the bar or the herbs, I definitely went from a blueberry kid in Charlie in the Chocolate Factory to just a normal fat guy with a glandular problem. I can't believe that you two got to eat a personalized dinner from Pierre Gagnaire. I don't even want to imagine what that cost. Does he have any opens in his kitchen...seriously. You should have asked him to show you how to make some of the dishes.